We posted last week about the challenges faced by people with learning disabilities and diabetes. This New Zealand study looked at the additional challenges associated with self-management, which for people who do not have learning disabilities is encouraged. As the authors point out, this requires understanding of the disease and the implications of the actions of self management. The researchers wanted to explore how to improve self-management of diabetes and to do this, worked with 14 adults with learning disabilities, 8 men and 6 women, 6 of whom had type 1 diabetes and 8 of whom had type 2 diabetes. Whilst type 1diabetes can occur at any age, it is most often diagnosed in children, adolescents, or young adults. In type 1 diabetes, beta cells produce little or no insulin, needed to move blood sugar (glucose) into cells Type 2 diabetes occurs slowly over time and most people with the disease are overweight when they are diagnosed, a major risk factor in developing type 2 diabetes. The adults with learning disabilities were interviewed, along with people who knew them well, who could act as key informants. 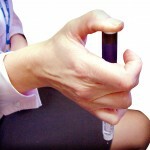 The researchers also got the results from blood sugar level tests. those with very basic knowledge and poor understanding. All of the participants were involved in some way in the self management process, with particpants in all three groups having some level of understanding of the role of diet, blood sugar levels, and exercise in the management of diabetes. Key, as ever in the process was the nature of the support they received from others, even for those who had good understanding. They found that diabetes impacted significantly on most areas of the lives of the participants. In some cases it was cited as a reason for preventing them from living independently. Strategies for helping to improve self management were suggested by the interviewers, which included the use of a “buddy” system to encourage exercise. The researchers conclude that it is possible to involve adults with learning disabilites in self management of diabetes, but that critical to the success of this is education and support. They recommend that each individual needs a personal plan to ensure they receive bespoke education and support. They also suggest that peer-led education and user-friendly resources would ensure that people receive appropriate lifelong education and ongoing support. This is great news – I am an LD student nurse hoping to specialise in Diabetes care and this is a terrific spur – I have been reviewing an extra module on diabetes at the OU outside my course and I will be doing this.. Thanks for your comment Catherine – good to hear that this research has had the effect of spurring you on! Obviously this is research that took place in New Zealand, but there are lots of good things happening in the UK. Perhaps our readers would like to let us know of any approaches they take to help with self management of diabetes? I am currently doing a Diabetes module as part of a degree course. I am a CLDN with an interest in diabetes, and would welcome any information/techniques used to support people with a learning disability to self manage their needs. And of course I am willing to share what I have gained too !